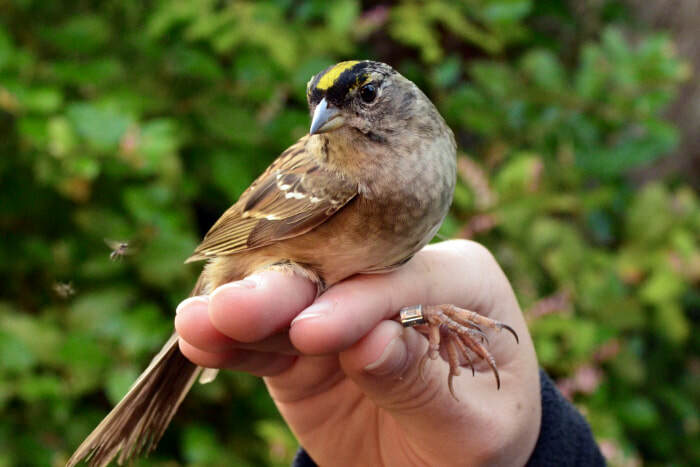 Golden-crowned sparrow photographed by Kim Wetten with the VIU Bird Banding Project. 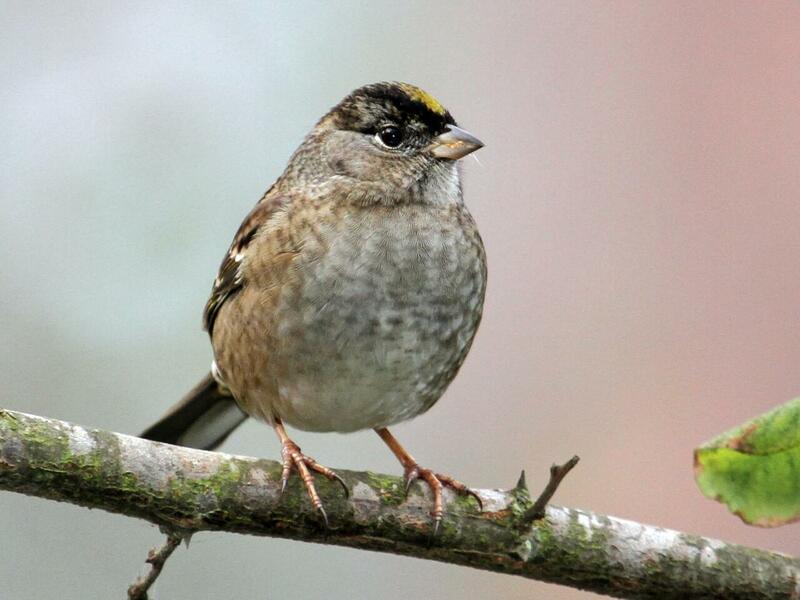 A yellow crown patch is the most distinctive feature of this sparrow's adult plumage. Breeding birds have bolder head colouring, with the bright yellow crown patch bordered by wide black stripes above the eyes and a contrasting grey face; in winter these colours are duller, with variable levels of black on the crown. The rest of the plumage is brownish or greyish-brown, with some brown streaking on the back. The juvenile's head is more brown, its breast and sides are streaked, and its crown patch is muted to a dull yellow on the forehead. This large sparrow's song consists of a few sad-sounding, clear notes that is often described as resembling the phrase "oh-dear-me". See the BC Breeding Bird Atlas species page for more information. The golden-crowned sparrow is found on the Central Coast during its migration from its winter range along southern parts of North America's west coast, to its northern breeding grounds in central and northern BC, Yukon, and Alaska. During winter and migration it inhabits brushy habitats such as thickets, forest edges, gardens; when breeding it can be found in shrubby tundra habitats. Click here for a range map. 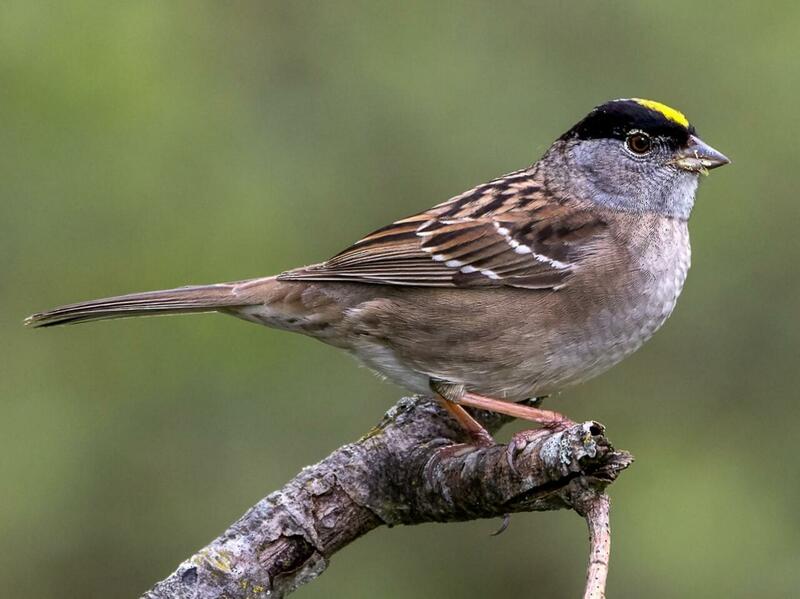 The white-crowned sparrow (Zonotrichia leucophrys) and white-throated sparrow (Zonotrichia albicollis) have similarly bold black head stripes, but they lack the yellow crown patch. The former also has a yellow, orange, or pink bill, and the latter has a white throat patch and small yellow patches in front of the eyes. Dunn, J. L. and Alderfer, J. (Eds.). (2011). National Geographic Field Guide to the Birds of North America. (6th Ed.). Washington, D.C.: National Geographic Society. Pp. ​284-285. Golden-crowned sparrow Zonotrichia aptricapilla. Audubon Guide to North American Birds. Accessed 04/04/2018. Ryder, J.M. (2015). Golden-crowned Sparrow in Davidson, P.J.A., R.J. Cannings, A.R. Couturier, D. Lepage, and C.M. Di Corrado (eds.). The Atlas of the Breeding Birds of British Columbia, 2008-2012. Bird Studies Canada. Delta, B.C.